Downside Monastery is a fine Grade II * Listed Building constructed during the late 19th Century to designs by Dunn and Hansom. The monastery was constructed in the Mid Victorian era from Bath and Doulting limestone, both of which are local to the area. 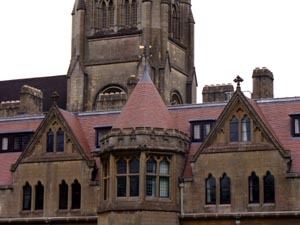 The buildings were designed by Hanson & Dunn. 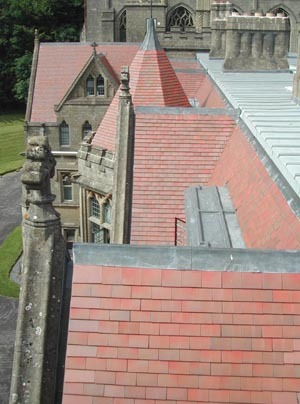 The project was to re-roof the Monastery building and to achieve a close match to the original Broseley tiles. Dreadnought Country Brown Smoothfaced tiles were specified by the architects Beech Tyldesley after gaining approval from English Heritage. The main challenge was to replace the existing Broseley tiles laid in the 1870’s with a tile that matched as closely as possible. 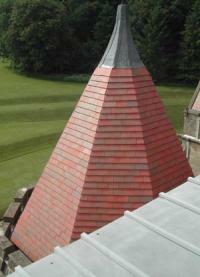 Sufficient Broseley tiles were salvaged to be used on the inner roof elevations of the building. New Dreadnought Country Brown Smoothfaced tiles were used on the outer elevations. Mr Stuart Forsey, the clerk of works explained that the Broseley and Dreadnought tiles were virtually indistinguishable. The roof needed to be upgraded with insulation to meet current Building Regulations. To meet this requirement the roof was raised by approximately 100mm. This meant that all ridge lines, secret gutters and valleys were raised to accommodate this change. Dreadnought Country Brown Smoothfaced tiles were specified as the replacement tile because they were a very close match to the original tiles in every respect. Mr Stuart Forsey, the clerk of works explained that the Broseley and Dreadnought tiles were virtually indistinguishable. Dreadnought tiles are traditional single camber shape, and all the colours are natural; produced without any artificial spray on stain or pigment.